Thenmozhi Soundararajan was the winner of a 2017 Eyebeam Award. She is a transmedia storyteller and technologist who believes the story is the most important unit of social change. Her work has been recognized by the Producers Guild of America Diversity Program, The Museum of Contemporary Art, The Robert Rauschenberg Foundation, Chicken and Egg Foundation, The Annenberg Innovation Center, Slamdance, MIT Center for New Media Studies, The Sorbonne, Source Magazine, Utne Reader, The National Center for the Humanities, The National Science Foundation, The Indian Film Festival of Los Angeles and The Alfred P. Sloan Foundation. How do you think about the use of technology for storytelling? Technology for storytelling has always been one of the defining themes of my work. 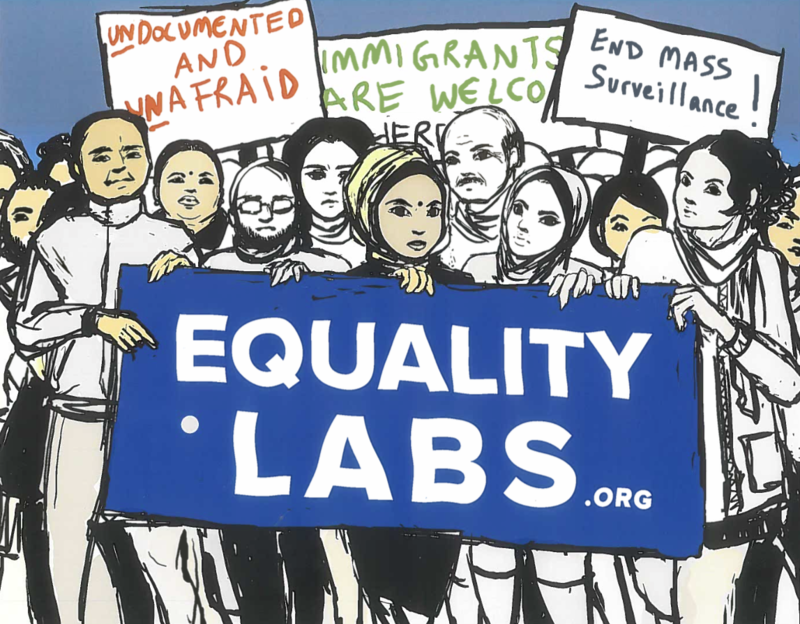 Whether it’s digital storytelling for one of my first collectives: Third World Majority, which was also one of the first woman-of-color technology organizations in the country; or my work at Equality Labs. I use these platforms to democratize voices and create different opportunities for self-determination for communities that have been left out because of systemic inequality. Be it race in the United States or caste in India, we are leveraging technology to try to flip hundreds of years of discrimination. As a socially engaged artist, my goal is to leverage this tool to open new perspectives; to explore Process and Products and ways people can find and use their stories to identify the future they want. Because these are rooted in their own experience and context, and their knowledge of the problem. You’ve said before that you think of the story as “the basic unit of social change.” Could you expand on that? In many ways, and I’m thinking of my own journey as a creator and community organizer, systemic discrimination and violence is inherently disturbing. In socially engaged work you have to create a common space to understand: who you are, what your roots are, what your problems are, and how you want to imagine a future beyond violence and systemic discrimination. All this critical work can only really be done through storytelling. And when someone asserts their identity in the face of discrimination, it empowers them in the space of the imaginary, to take steps in the material world. And this is true of myself. 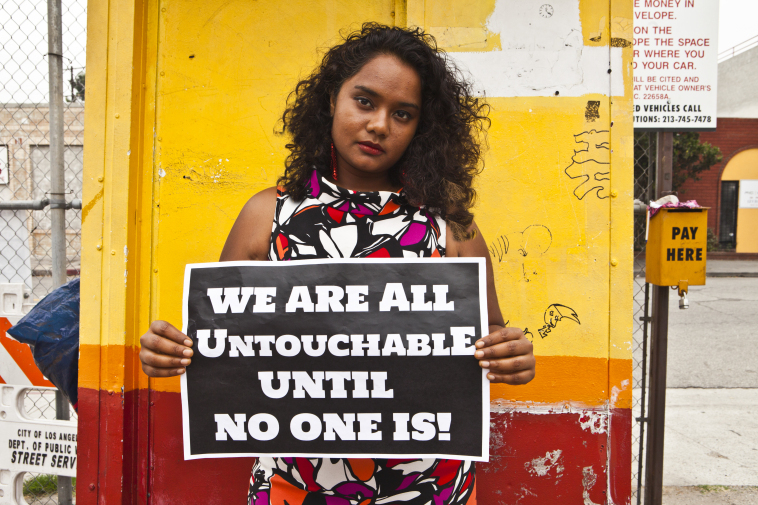 While growing up as a Dalit American, there was no representation of my experience, neither as a woman-of-color nor as a member of the Dalit diaspora. The battle of the imaginary became part of my liberation process. I read different authors and creators who inspired me. As I saw my work in other women-of-color, writers and thinkers, I was able to create a path for myself and my community. Story helps build community, to build a sense of self, and a connection with other people. It creates the vision that otherwise might not be possible in the face of systemic discrimination. In addition to advocacy, you conduct a great deal of training in digital security. Both in terms of production as well as to encourage others to become organizers. Could you talk about the digital security training that you are doing in relation to the systemic change you are trying to induce? Before getting into digital security, I would like to speak briefly about the participatory pedagogy of my artistic process. A lot of it has to do with my own Dalit legacy. Under the brahmanical system, Dalits were, for centuries, systematically denied access to essential education and knowledge. If you refer to one of the key scriptures within the Hindu faith, the Manusmṛti, it condemns the shoodra or low caste person who dares to even hear the Vedas, to having lead poured into their ears or their tongues cut out. In such an environment, knowledge itself becomes the framework to express who we are and to fight for our rights. This thread runs in my family and in who I am as a creator. My grandmother was one of the first women to have been educated in a village, and she became a teacher. I choose to teach and create because many of those realms of both artists and technology are denied to people. There is an impatience and nervousness I have about the fact that not everybody who needs to be part of the solution is at the table. Simply because of their lack of literacy and the access that I have. I am a Dalit American who did not grow up in India but is intimately connected to the oppression of my people. I strongly feel that until all of my people are free, I am not truly free. And there has always been an effort in my mind to expand knowledge and opportunities that are as collaborative as possible. This problem brings us to the digital security work concerning the things that I experienced as an artist with political blowback from Indian administrative officials. In being able to return back to the country, I found that throughout the movement against apartheid, there were many people who were prevented from traveling, that were arrested for speaking their mind about caste and for being part of movements that were vital to our resistance across the country. Then I realized that social networking and the platforms we were using to organize were liabilities in terms of our physical safety. That’s when I started teaching digital security. We had a tour last year named after the hashtag DalitWomenFight. 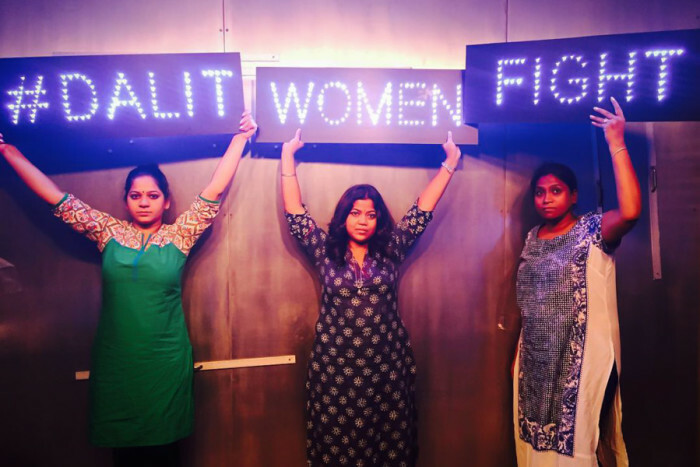 Dalit women fight is the art inspired by the social media campaign of the All India Dalit Womens Rights Forum. An hour before our colleagues assembled, our entire network was hacked. They hacked our routers, devices, computers. And when they made contact with our team, they had used some form of social engineering whereby they knew exactly who on our team were immigrants. Masquerading as ICE (Immigration and Customs Enforcement) officials, they threatened us saying we are in violation of our visas if we don’t divulge data related to where we were and our campaign. With the rise of global fascism, socially engaged artists who are deeply connected to their communities, and are taking on violent state apparatuses around the world, are going to find that they will need digital security in order to be able to have longevity in the movement they are a part of. Digital security gives cover to artists and organizers to continue to build movement and power safely. And it’s a complete shift from when we first adopted these technologies. They were a vehicle of performance and these platforms were going to rally the movement, and nothing would be unavailable to us if we just gave ourselves completely online. My experience and the experience of many, many organizers from Egypt to India to the US, is realizing that social media organizing is an important practical need for the whole movement. This is one of the reasons why we started security training along with our artistic engagement. A part of our thinking is that there’s no way to have the full extent of freedom of expression when freedom of privacy is being threatened. When the laws are failing to protect the right to privacy it is up to us as citizens to protect ourselves with the available tools and open conversations about community. You mentioned that you’re working on curriculum for a technology English literacy program. Is that something you’d want to talk about? We are working on the first digital security curriculum developed by Women of Color in the US that will help bring Digital Security for all. This is what is interesting about being a socially engaged artist which is different from strictly a performance artist: in the auteur model so much of your artistic credibility is really about the shows that you’ve curated and the individual work that you claim, but much of my work is anonymously deployed. Specifically because I have to face opposition in my process, and a very violent one at that. This is why socially engaged art and the platforms of socially engaged art are critical now, more than ever. The more conversations we can have about this difference and how artists are a necessary part of the table of social change and what we bring to it, engenders so many more possibilities for a movement rather than a movement without artists. What do you feel artists can do to bring about social change? What do you think works? Process and Product are the hallmarks of where we want to move and impact our socially engaged artistry. This is where I would start my conversation with collaborators to see where this common ground might be. When we talk about the impact of Process, there is incredible room for opportunities for a movement that consists of things broader than the immediate battle in front of them and broader also than the system of oppression they might be tackling. I think people take for granted how potent the imaginary is. Socially engaged artists bring that engagement of the heart, they bring that full bodied excitement because artists happen to have a subjective mind to question what moves, inspires, and connects people. In terms of the Product I think that you have a landmark, an archetype that basically grows past the movement. Something that people can learn and grow from, that they can put a little tick to, and that helps them understand: what did they learn from this movement, what did they want from it and where do they stand in terms of the next goals, next steps and processes?